On December 7, 10 farmers of the Buyi and Miao nationalities in Southern Guizhou took over the relay baton from the hands of project phase 1 households to start phase 2 of SSCLF’s Farmer Entrepreneurship Relay Baton Project. The project households are mainly doing bacterial sticks inoculation and breeding bacteria. The photo above on the left: The project phase 2 launching meeting. The photo above on the right: The project households vaccinated, loaded and unloaded fungus rods in the cooperatives. After 3 years of hard work, 20 project households successfully completed the project phase 1 and are making preparation for the project phase 2. On November 10, the cooperatives organized project households to have training course on fish farming skill. The photo abve: Li Ping and Li Changquan are selling fish at the scene. Because of successful completion of the project Phase 1, the project households increased income by 30%, and their lives are stable. The main work for the project households this quarter was the procurement and processing of fragrant thatch. On November 15, the cooperative organized the 20 project households for lemongrass harvesting and packaging training. 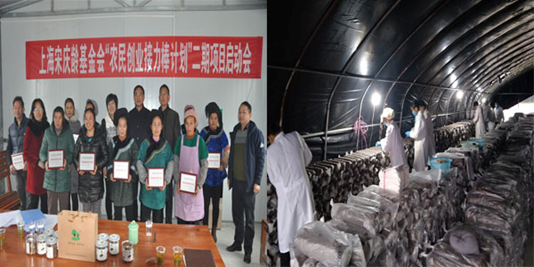 The photo above on the left: Project household Chen Dongtong providing fertilization for fragrant thatched lemongrass to spend the winter safely. The photo above on the right: Project household Pan Qiuling caring and protecting the fragrant thatch. Project households mainly harvested water bamboo with household output of 35000 katty water bamboo, and receiving more than 95000 yuan. 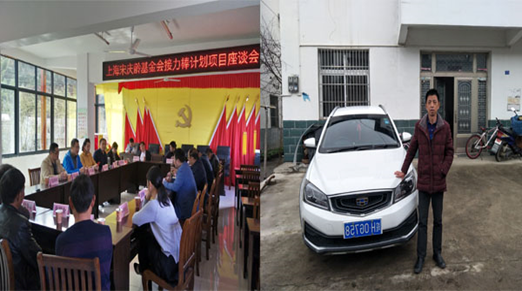 The photo above on the right: Project Peng increased revenue and bought a car after taking part in the project. The main work for 20 project households this quarter is selling honey, and doing wintering management. 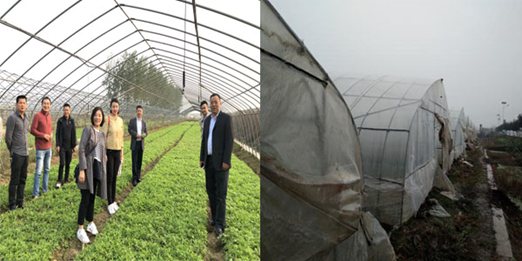 The photo above on the left: Volunteer general manager Guo paid a visit to the base and took picture with project director Bai. 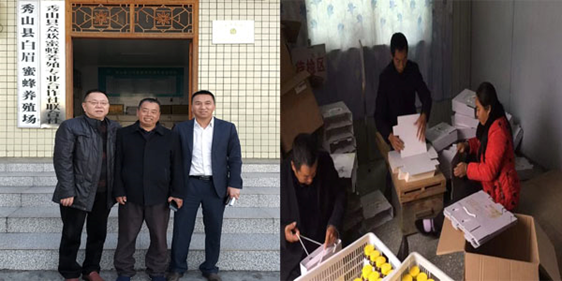 The photo above on the right: The project household Tian Ruijun and his wife packed honey in the Cooperatives. The twenty project households mainly managed tea garden this quarter. 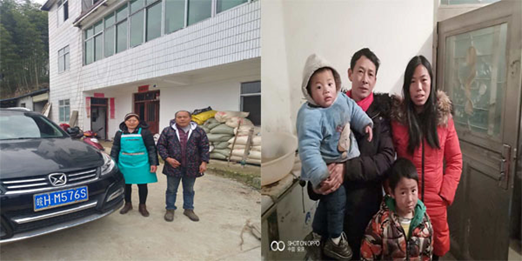 The photo above on the left: The project household Jiang Mansheng improved living condition after taking part in the project and bought a car; The photo above on the right: Project household Wang Yeqi took part in the project and lived a happy life, and gave birth to second child. The main job for 10 project households this quarter was picking hook vines. The photo above on the left: Project household Wu Xianke is constructing the new building. They will move to the new building on Lunar November 8. The photo above on the right: The Cooperatives organized the project households cutting Hook vines. Project household Zhou Yong told us that since participating in the SSCLF Farmers Entrepreneurship Relay Baton Project, the land he planted has increased from 5 mu to 20 mu, no longer need to go out far to work, and he is looking forward to doubling the annual income. This quarter Chrysanthemum was in the normal growth management period. On October 5, the cooperative organized 20 project households to participate in the training on water and fertilizer management in cultivation of Artemisia quinoa. Project households mainly sell cauliflower, bamboo shoots and other winter crops. The most recent price of cauliflower is 0.2-0.5 yuan each katty. 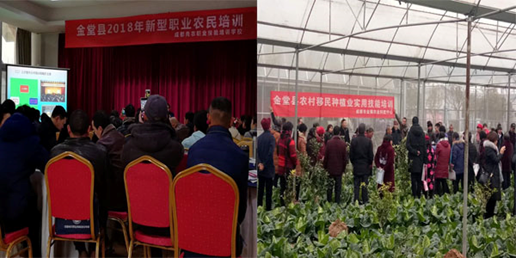 The left photo above: On December 17, the Cooperative organized project household Wu Shiyuan, Li Zhiyou and other persons to participate in 2018 Jintang County New Vocational Farmer Training. 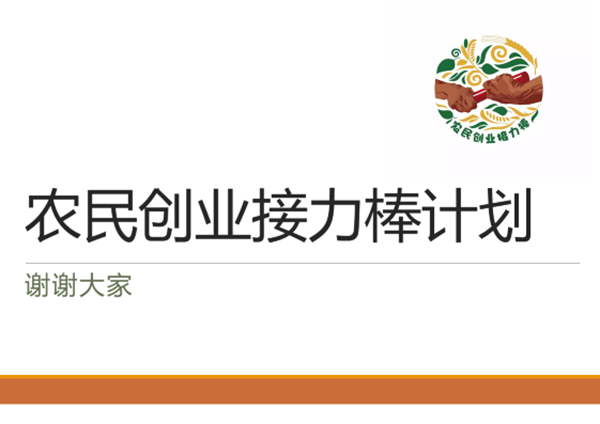 The training courses include fruit and vegetable planting technology, new varieties, agricultural product quality and safety, and internet marketing and so on. 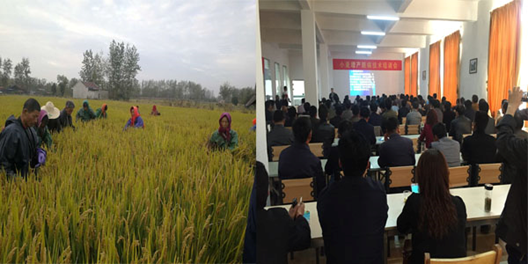 The right photo above: Project Households Zhao Zhenglong, Zhang Tongxu are participating in the planting technical training. On November 13, the cooperative organized project households to have on-site training on Kiwi winter management and Kiwi plastic trimming technology. The photo above on the left: When the project phase 2 was launched, volunteer general manager Guo, project director Yang Jing and project households had a meeting. The photo above on the right: Project households make stone sulfur mixture to prevent pests and diseases. The main work for 20 project households this quarter is fertilization, watering and weeding. 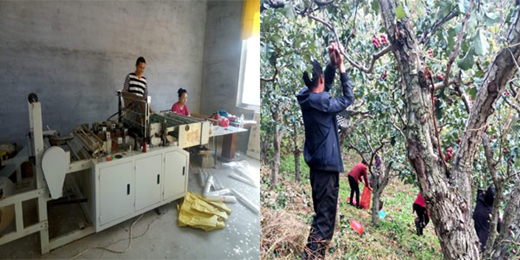 The photo above on the left: Project household Xuan Keeyao is packing and loading guava. The photo above on the right: The cooperative organizes project households to have barbecues as well as tug-of-war competitions to enrich life. The project phase 2 households harvested dragon fruits and strengthened fruit tree management and care. From October to December, 86,000-katty dragon fruit was sold at wholesale price of 6 Yuan each katty. The photo above on the left: The cooperative held a technical training for project households. The photo above on the right: Shareholding signing by Li Haisen and Chen Yangfu. The main work for 20 project households is tea garden fertilization, training, and new product -Xin’an winter tea research and development. 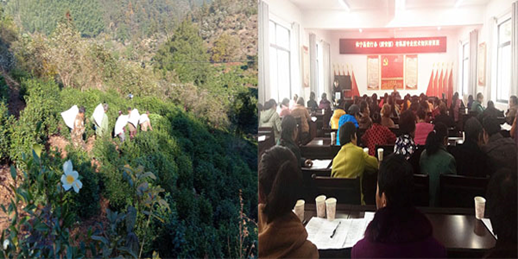 On November 17, the Cooperative and County Word Bank Office jointly organized 160 people to participate in "Xin’an organic tea knowledge training course." On October 10, the cooperative organized project households to participate in a training course on wheat production increase and disease prevention. They are busy in harvesting rice. The photo above on the left: On October 8, project household Jiang Fuming and his family members were weeding in rice field. The photo above on the right: The technical training on wheat production increase and disease prevention. The main task for the project households this quarter is busy selling bamboo shoots. The photo above: The bamboo shoots harvested by Lu Anmin, Lu Anqin and Lu Wenhao. The project households mainly carry out winter branch pruning, garden weeding, turning over in-garden soil, fertilization and pest control. 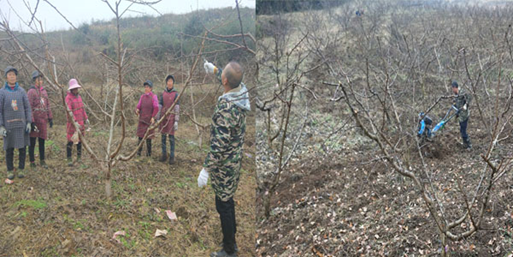 The photo above on the left: The Co-operative director Dai Jun demonstrated fruit tree pruning for some project households. 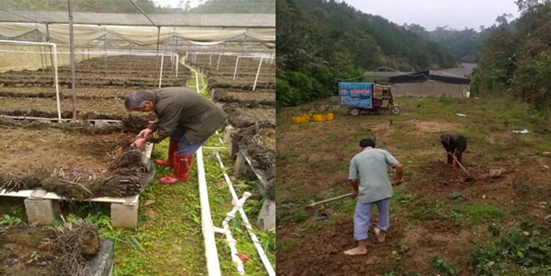 The photo above on the right: Project household Chen Longyuan turning over the soil. 20 project households worked on rice harvesting, selling, and sowing wheat. The photo above on the left: Acceptance site of Project household Ge Maobing’s rice and duck demonstration field. In October, Hawthorn matured, the project households mainly worked on picking Hawthorn. In November, some project households do some assistant work in cooperative, guarding cold storage and cutting hawthorn into slices and so on. In December, the cooperative began selling hawthorn, and paying money to the project households. The photo above on the left: Ma Yanwen, Guo Changzhi couple newly purchased bag-making equipment. The photo above on the right: Cooperative organized project households picking hawthorn. The project households normally manage the weeding and fertilization of Dendrobium, repair some problems in the planting bed, and then plant some fruit trees. The photo above on the left: Project household Gan Anda is repairing some problems in some planting beds. The photo above on the right: Project households Gan Fenda and Gan Anda are planting fruit trees. The main work for project households this quarter is harvesting rice and growing rapeseeds. The photo above on the left: Han Rongsheng’s Harvest Site. 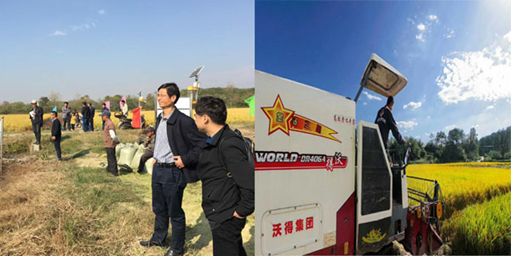 The photo above on the right: Project Huang Jianzhong picking up rice spikes (corners that can’t be cut by the harvester). The main job of the 20 project households in the quarter was to harvest the crops planted in the tea fields, and weed and fertilize in the tea garden. The photo above on the left: The tea garden after weeding. 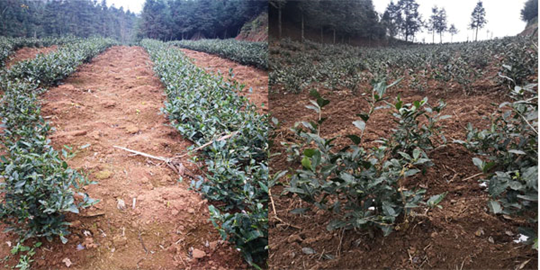 The photo above on the right: The tea garden after fertilization. The main work for the new 16 project households this quarter was to fertilize, insecticidal and picking watermelons. The photo above on the left: Project household Gong Zhigang is selling watermelon. 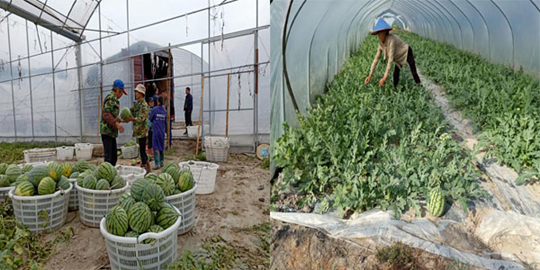 The photo above on the right: Project Household Zhang Yunxiu is looking at whether watermelon seedlings are healthy.